This article is a primer on a term that is being used to describe the evolution of industry in general, The Fourth Industrial Revolution. A short overview about Robots, Androids, and the Technological Singularity. Written and designed for the college student or artist who wishes to gain an understanding of figure drawing and figure sculpting. This 160+ page publication describes various approaches, methods and techniques for drawing with charcoal and sculpting with clay. Contains numerous examples from an in international list of artists as well as a special section for the portrait. Contains glossary of terms and suggested syallabi for instructors wishing to teach figure drawing or sculpting courses. "As spring transitioned into June, I was anxious to begin adding clay to the metallic armature that would become the sculpture of E.T. 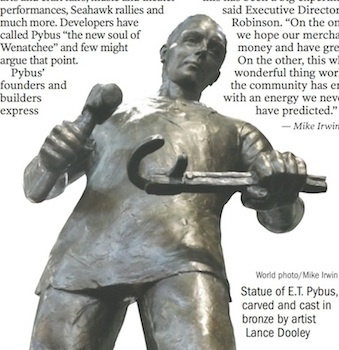 Pybus, the legendary man who ..."
"We're capturing the spirit of what E.T. Pybus was all about,' said Dooley. 'He was a self-made man who came to this country, worked hard and made the community a better place ..."
A one page special article frome the Wenatchee World, describing all the successes of Pybus Public Market. The sculpture of Mr. ET Pybus (Man of Steel) is featured at the bottom of the page. The 2016/17 cycle of the Percival Plinth Project an outdoor sculpture venue located in the downtown waterfront area of Olympia, WA. 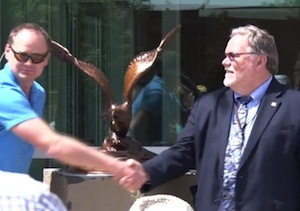 Viewers can experience the highly renovated waterfront, with glimpses of the capitol building in the background. More info on the EVENTS page. A solo show in the lounge area of O'Grady's Pantry on the campus of the enchanting Sleeping Lady Resort just outside of Leavenworth, features a selection of Lance Dooley's wildlife work. ANIMALI = the Italian word for animals. Solo show anthology of life drawings created by Lance Dooley. Another one from the SkiPow vault. Filmed and edited by Shane Wilder (Skipow), Wenatchee based artist and sculptor Lance Dooley talks about his journey into the arts. 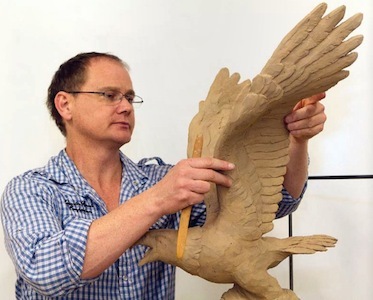 He shares insights into his process and talks about his passion for drawing and sculpture. 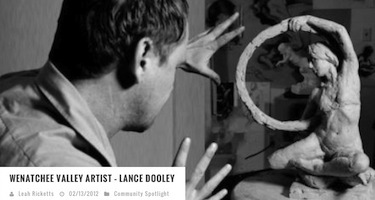 Watch Lance work on recent projects and see many of his past works. The entire ceremony is caught on video. It was a very bright day, so forgive my strange looking sunglasses.